In India in the court of the Mughal emperor Akbar following the European introduction of tobacco to India, Hakim Abul Fateh Gilani a descendant of Abdul Qadir Al-Gilani came from Baghdad to India who was later a physician in the court of Mughal raised concerns after smoking tobacco became popular among Indian noblemen, and subsequently envisaged a system which allowed smoke to be passed through water in order to be ‘purified’. 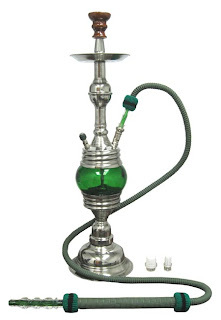 Gilani introduced the hookah after Asad Beg, then ambassador of Bijapur, encouraged Akbar to take up smoking. Following popularity among noblemen, this new device from Arabiafor smoking soon became a status symbol for the Indian aristocracy and gentry. The Indian Hookah was designed differently from the Arabian Hookah or Shisha which was invented during the Abbasid Empire in Baghdad. They were different in shape and design.